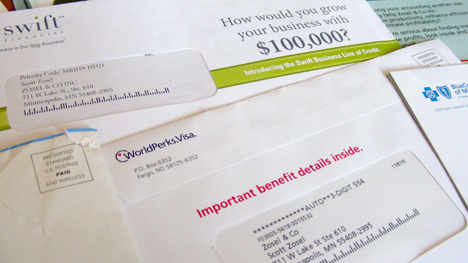 Recent marketing debates: Direct Mail vs. Permission-Based Email? If you are still using direct mail a primary lead generation tool, consider permission based email. You can easily get the same results for a fraction of the cost. If you’re like me, you probably get hundreds of pieces of mail each week. And many of the letters, postcards, or self-mailers are beautifully crafted with offers designed to attract the industry standard 1%-2% response rate that will make each direct mail campaign profitable, even though we toss these expensive mailpeices in the garbage. When I say expensive, I mean big bucks. For example, practically any of the mailers shown in the photo above cost anywhere in the range of $.65 – $1.50 each (mailed), depending on the quantity. And when you’re talking quantities of 10,000 to 50,000, that’s huge dollars, particularly if you’re just using Direct mail to prospect for new leads or customers who have never heard of you. And while the traditional direct mail industry seems to be going strong, Permission-based email is less than half the cost of of traditional direct mail marketing, to very likely produce the same results. This makes me wonder if the companies using direct mail have ever tested permission based email marketing. When I say a fraction of the cost of traditional direct mail marketing, here’s what I mean. We recently quoted a price for an email campaign for a B2B client for 142,000 emails. Total costs, including creative, custom landing page (essential), and delivery was about $.05 per unit. That’s pretty typical. Compare that with $.65 – $1.50 each (mailed) for the quantities of 10,000 to 50,000 I mentioned earlier. How could a marketer who is looking for great results for the dollar afford not to test permission based email marketing? Permission based email marketing can easily achieve the industry standard 1%-2% response rate. Sometimes better depending on the list, product and offer. Permission based, or opt-in E-mail campaigns are by far the most cost effective method of lead generation today. With the proper development expertise, you may achieve much higher response rates than traditional direct marketing at much lower costs with faster turnaround times. Proper development may make it perfect for new product introductions, marketing offers, newsletters, target new markets, etc. 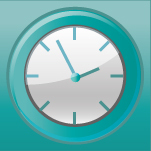 Plus, we can provide a highly accurate means of measuring response and conversion. SPAM Sensitive? From what i understand, permission based email marketing is somewhat misunderstood. No matter how legitimately the email names were generated, marketers in general have a strong perception that all email marketing is SPAM. If you’re a little leery of email marketing becuase of the potential for spam, here’s the good news. All legitimate permission based email marketing companies follow very strict guidelines that protect you and your company’s reputation. Must comply with the CAN SPAM Act of 2003. Certify that all ‘opt-in’ emails sent contain an ‘opt-out’ option for the message receiver, a return email address and a non-deceiving subject. Complete documentation of how opt-in records were collected (email form, address, IP address, date time Database sources assume liability for any and all legal issues with regards to the database. Spam filter testing and deliverability rate of 100%. The databases used will clean their records at least 1 or 2 times a month to ensure deliverability.